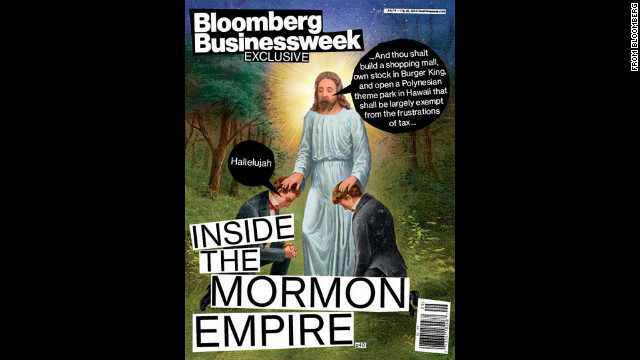 The cover is a caricature of a painting that shows John the Baptist blessing Mormon leaders Joseph Smith and Oliver Cowdery. The article – titled “How the Mormons Make Money,” by Caroline Winter – is an in-depth look into the business side of The Church of Jesus Christ of Latter-day Saints, with much attention given to the tax benefits the church enjoys and the extent of its holdings of property and stock in multinational corporations. The magazine cover, the aspect of the article receiving the most criticism, is a caricature of a well-known Mormon painting that shows John the Baptist blessing two Mormon leaders, Joseph Smith and Oliver Cowdery. Purdy’s disapproval extended beyond the cover. He said the article was “biased, inaccurate and speculative” in nature. “The article misses the mark and the cover is obviously meant to be offensive to many, including millions of Latter-day Saints,” Purdy wrote in an e-mail. Multiple calls and e-mails by CNN to representatives at Bloomberg went unanswered. Even still, Brooks wrote, the shock of the cover image will keep most readers, especially Mormons, from taking the article seriously. The vastness of the church’s holdings are quite remarkable, especially considering the relative age of the church and the size of its membership, the article says. According to Businessweek, a recent study by Ryan Cragun, a sociology professor at the University of Tampa, estimates the church receives around $8 billion in tithing from members each years and is worth around $40 billion. Those estimates would be tough to solidify, said Rusty Leonard, CEO of MinistryWatch.com, a site that keeps a database of Christian ministries and nonprofits for donors to use and evaluate. The IRS does not require churches, which are tax-exempt, to file disclosure forms with the government. Leonard said that makes the totality of church holdings difficult to pinpoint. “They get tax-free status as a church and they get the freedom to do what they want to do with their money,” Leonard said. This is true, he said, for everything from a local congregation to a large entity like the Catholic Church. But the difference, according to Leonard, is that people can see what is going on in their own congregation, something they can’t necessarily do for an entire religious body. “When you are talking about an institution, like the Catholic Church or the Mormon Church, if they don’t voluntary disclose, you don’t really know what they are doing,” Leonard said. When asked about the $40 billion figure provided by Cragun, Doug Anderson, public affairs manager for the Mormon Church, refused to comment. The idea of Mormon hit pieces has been common in recent months, especially because likely Republican nominee Mitt Romney is a member of the faith, leaving conservatives and Mormons alike to worry that his candidacy will open the door to unfair characterizations of the church. Nancy French, a blogger for the website Patheos, spoke to this concern in her column about the cover. The church-owned and operated Deseret News paper wrote an editorial that not only went after the reporting – “the corners cut in this week's Businessweek story do a disservice,” read the editorial – but also went after the legitimacy of Businessweek itself. Spiritual can be enhanced by always making sure that you have compassion to everyone. .